Chocolate chip cookies are my kids’s absolute favourite. Whenever I bake any other type of cookie they ask, “Why Mom? Why?” Their logic is simple; why even bother trying something new when we are comfortable with one kind? Makes sense. 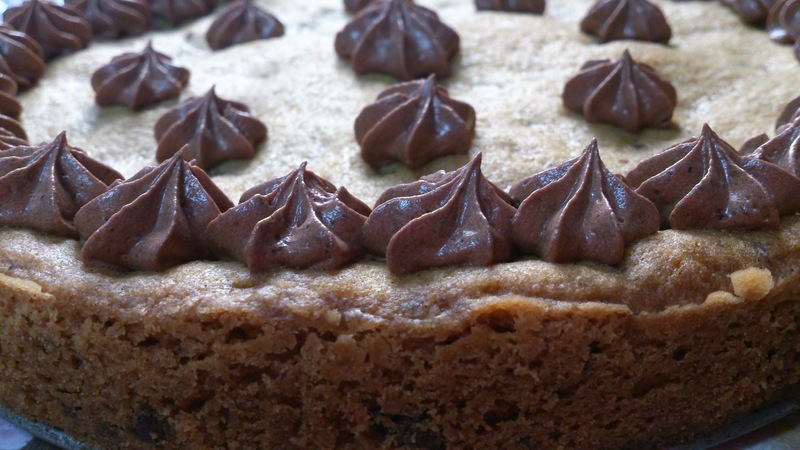 I love this chocolate chip cookie cake; It is very easy and quick and it is in a cake form! No cookie-linked hassle. Plus you get an extra dose of chocolate as icing ( which is totally optional ). Looks pretty cute too. The recipe has an extra egg yolk and some corn flour which makes it ultra soft and chewy. For the cake preheat the oven to 180 C/ 350 F. Lightly grease a 9 inch round pan. Set aside. In a large mixing bowl beat butter with an electric mixer for a minute until smooth and creamy. Add brown sugar and beat for another minute till creamy. Mix in egg, egg yolk and vanilla. Scrape down the bottom and sides of the bowl as needed. In a separate bowl, mix flour, corn flour, baking soda and salt. Add the flour mixture to the butter mixture and beat on low speed until combined. Stir in the chocolate chips. Press the cookie dough evenly into the prepared pan. Bake for 20-25 minutes or until the cake is golden brown from the top. If you see the cake browning too fast, loosely cover with aluminum foil to avoid heavy browning. Remove from the oven and place on a wire rack to cool completely. Can be served directly from the pan. 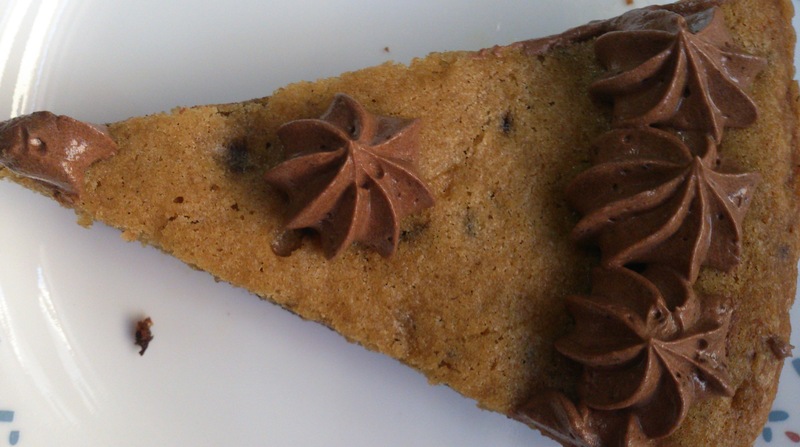 Use a sharp knife to loosen the sides of the cookie cake from the pan if you want to transfer it to a serving dish. For the icing, sift together icing sugar and cocoa powder. With an electric mixer beat butter for 30 seconds till creamy Gradually add sugar/cocoa mixture alternating with milk/cream. Beat on low speed until creamy. Add salt and mix again. Decorate the cake as you like. For best texture, always bring ingredients to room temperature, including eggs, before mixing. Measure flour carefully. Excess flour will not give good texture. There will be some leftover frosting which you can refrigerate for a couple of days. Using cream for frosting will make it creamier. Thanks Bec! This recipe never fails me. If it is approved by kids it’s a success. I would love a visit from you! your blog is very nice and I also make this cookie or similar! oooh yes please! What an epic cookie.